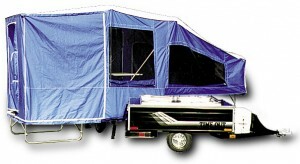 Time Out Trailers makes four different models of pop up tent trailers. These are some of the lightest pop ups on the market, which is great if your tow vehicle is on the smaller side of the scale. In fact, some Time Out Trailer owners even use a motorcycle as a tow vehicle. You can’t get much more versatile than that when it comes to pop up campers. While these tent trailers aren’t full-blow utility trailers when folded up for travel, they are capable of hauling up to 450lbs of cargo, although you have to pay attention to the towing capacity of your car (or motorcycle) when loading down your trailer with additional weight. One of the most intriguing features of these pop up tent trailers is how quickly you can set them up and tear them down. Setup time is only about three minutes, and they also fold back up very fast.